Andrea De Matteis, Founding and Managing Partner of DE MATTEIS Studio Legale, will be a panel speaker at the 15th Edition of CARTE - a 2 day conference which is the point of reference in Italy for the payments industry. 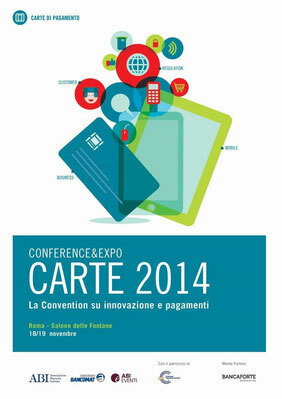 This event, which is organised by the Italian Banking Association, will be taking place on November 18th and 19th, 2014 in the Salone delle Fontane in Rome, Italy. Andrea will focus his discussion on the new regulations governing electronic payments in Europe. Panelists in the same session include Piero Crivellaro from MasterCard, Rita Camporeale from the Italian Banking Association and Isabella Artioli from Unicredit.